The outcome of the PDP's presidential election today will show to political observers if the party has truly gone through transformation and ready to take over power from the ruling APC which so corrupt especially in election rigging, to the extent that they Rigged The Results of ORDINARY direct primary involving only President Buhari. APC has about 300 people on line in one of such cases but counted Thousands. And these disgraceful acts were caught on camera. You can imagine a party "helping us" to fight Corruption. Sigh! The question is, will the PDP get its politics right today? Presidential aspirants on the party's platform were on Friday night handed over the list of delegates that would take part in the presidential primary scheduled for Port Harcourt, Rivers State on Saturday. 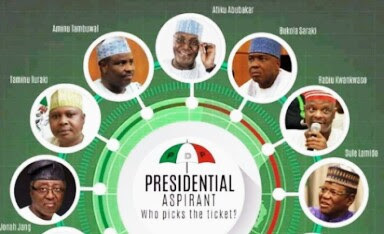 The aspirants who are taking part in the primary are a former Vice-President, Atiku Abubakar; Governor of Sokoto State, Aminu Tambuwal; Governor of Gombe State, Ibrahim Dankwambo; a former governor of Kano State, Senator Rabiu Kwankwaso; a former governor of Sokoto State, Alhaji Attahiru Bafarawa. Others are President of the Senate, Senator Bukola Saraki; a former President of the Senate, David Mark; a former Minister of Special Duties and Inter-Governmental Relations, Alhaji Tanimu Turaki (SAN); a former governor of Plateau State, Senator Jona Jang; a former governor of Kaduna State, Senator Ahmed Makarfi; a former governor of Jigawa State, Alhaji Sule Lamido and Dr. Datti Baba-Ahmed. Atiku, through the Director General of his campaign organisation, Otunba Gbenga Daniel, put the number of delegates at 4,000. It was gathered by The Punch that there were issues concerning the delegates lists from Kano, Lagos and Ogun states. For example, a camp of one of the aspirants said that the name of a former Speaker of the House of Representatives, Dimeji Bankole, was likely going to feature in the alleged revised version of the delegates’ list from Ogun State. The camp said that this might be resisted, saying that Bankole had left the PDP for another party in the state. In the case of both Kano and Lagos states, it was learnt that the national leadership of the party met on them in Abuja on both Thursday and Friday. Though decisions taken on them were still sketchy as of the time of going to press, a source at the National Working Committee of the party said that “whatever decision we take will be in the interest of everyone." Meanwhile, delegates in Port Harcourt were on Friday night discussing the likely outcome of the primary. 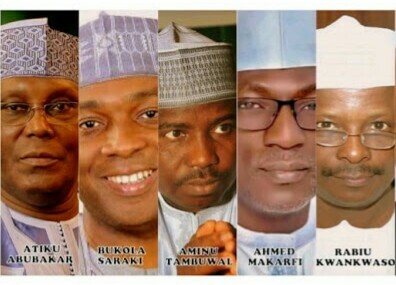 Based on their discussions at their various hotels visited by The Punch, the likely winners might be among Tambuwal, Kwankwaso, Atiku and Saraki. It was gathered that some aspirants might step down today before the commencement of the primary. Already, meetings were to be held late on Friday night among some of them. “The meetings were to discuss area of interest and how to win votes from geopolitical zones," a source said. In a related development, Governor Seriake Dickson of Bayelsa State has said that all the delegates from the state will adopt a common position on the party’s presidential primary. In a statement on Friday by his Special Adviser on Media Relations, Fidelis Soriwei, the governor noted that delegates from the state and the entire Ijaw nation would vote for a candidate with enough courage and capacity to restructure the country and one who would promote mutual respect for all Nigerians as well as create a levelplaying field for all, irrespective of ethnic and religious leanings. The Rivers State Police Command said on Friday that at least 12,800 personnel would be deployed to ensure a peaceful conduct of the National Convention of the PDP.